If you would like to let us know the outcome of the diagnosis, please do this via the Contact page. Did your back pain start when you were younger than 40? Unlike inflammatory back pain, mechanical back pain, such as herniation, is frequently of a more sudden onset. IBP has an insidious onset and patients are likely to have been experiencing back pain for > 3 months. Does your pain improve with movement? Symptoms of musculoskeletal inflammation are often improved with movement and exercise. Do you find there is no improvement in your back pain when you rest? Similar to the above, no improvement of the pain with rest is a classic feature of inflammatory back pain. Do you suffer from back pain at night which improves upon getting up? Patients with inflammatory back pain often experience a worsening of symptoms when resting at night, and waking during the second half of the night due to pain and discomfort is a key feature of inflammatory back pain. Inflammatory back pain requiring further investigation is usually indicated if the answer is ‘yes’ to 4 or more of these parameters. 1. Rudwaleit, M et al. Ann Rheum Dis 2009 ;68: 777-83. 2. Van der Linden, S et al. Arthritis Rheum 1984 ;27:361–8. 3. Rudwaleit, M et al. Arthritis Rheum 2005 ;52:1000-8. 4. Marzo-Ortega, H et al. Ann Rheum Dis 2009 ;68:1721-2. This website is intended for healthcare professionals (GPs, physiotherapists, osteopaths, chiropractors, nurses and rheumatologists) who see patients <45 years with chronic back pain (>12 weeks). The website is not designed for use by patients with back pain. 2. What do each of the categories on the results chart mean? 'Axial SpA improbable' – your patient is unlikely to have Axial Spondyloarthritis. Consider other potential diagnoses to explain the patients chronic back pain. 'Probable diagnosis of Axial SpA' – your patient is likely to have Axial Spondyloarthritis. Ensure that other possible diagnoses have been excluded. 3. What does this site not do? This website is not designed to replace the clinician who has trained for many years to diagnose patients. It is designed to be a decision aid for those who do not commonly see patients with inflammatory spinal disease. 4. What should I do with the results? Any patients who are in the 'additional tests necessary, probable or definitive diagnosis of Axial SpA' should be referred to a rheumatologist. If the clinician is comfortable with organising appropriate additional tests, this can be done for those patients in the 'additional tests necessary' category. The patients in the 'Axial SpA improbable' category should be re-evaluated for an alternative diagnosis. This website provides a clinical tool based on published research. It is not meant to be a substitute for a clinician with expertise in Axial Spondyloarthritis. This website cannot be held responsible for missed diagnoses of Axial Spondyloarthritis nor any other conditions which may explain the patients back pain. Rudwaleit M, van der Heijde D, Khan MA, Braun J, Sieper J. How to diagnose axial spondyloarthritis early. Ann Rheum Dis. 2004 May;63(5):535-43. Feldtkeller E(1), Rudwaleit M, Zeidler H. Easy probability estimation of the diagnosis of early axial spondyloarthritis by summing up scores. Rheumatology (Oxford). 2013 Sep;52(9):1648-50. Zeidler H, Mau R, Mau W et al. Evaluation of early diagnostic criteria including HLA-B27 for ankylosing spondylitis in a follow-up study. Z Rheumatol 1985;44: 249-53. Mau W, Zeidler H, Mau R et al. Outcome of possible ankylosing spondylitis. Clin Rheumatol 1987;6(Suppl 2): 60-6. Mau W, Zeidler H, Majewski A et al. 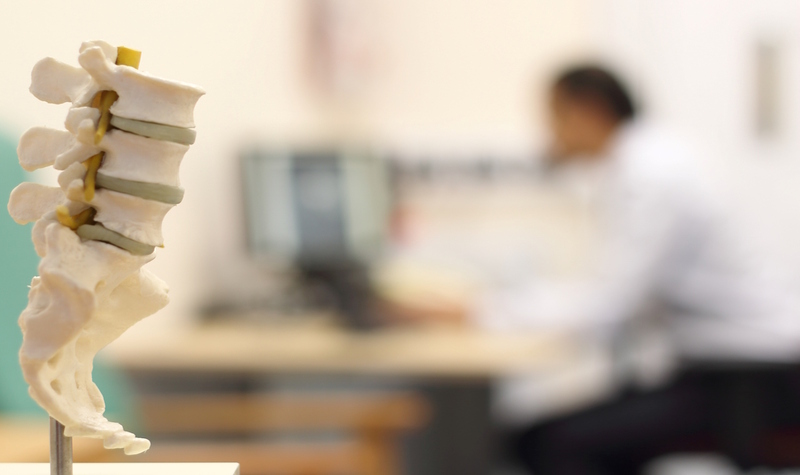 Evaluation of early diagnostic criteria for ankylosing spondylitis in a 10 year followup. Z Rheumatol 1990;49:82-7. Amor B, Dougados M, Mijiyawa M. Critères de classification des spondylarthropathies. Rev Rhum 1990;57: 85-9. Amor B, Dougados M, Listrat V et al. Èvaluation des critères des spondylarthropathies d'Amor et de l'European Spondylarthropathy Study Group (ESSG). Ann Mèd Interne 1991;142:85-9. Rudwaleit M, van der Heijde D, Khan MA et al. How to diagnose axial spondyloarthritis early? Ann Rheum Dis 2004;61:535-43. Rudwaleit M, Feldtkeller E, Sieper J. Easy assessment of axial spondyloarthritis (early ankylosing spondylitis) at the bedside. Ann Rheum Dis 2006;65:1251-2. Grimes DA, Schulz KF. Refining clinical diagnoses with likelihood ratios. Lancet 2005;365:1500-5. Calin A, Porta J, Fries JF et al. Clinical history as a screening test for ankylosing spondylitis. JAMA 1977;237: 2613-4. Rudwaleit M, Metter A, Listing J et al. 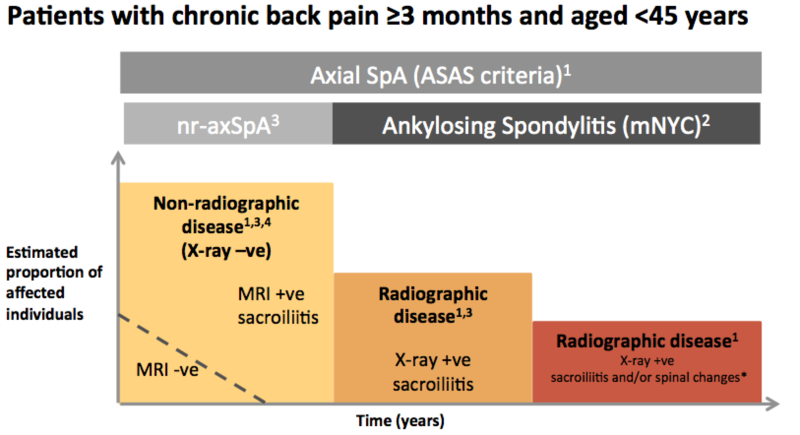 Inflammatory back pain in ankylosing spondylitis—a reassessment of the clinical history for classification and diagnosis. Arthritis Rheum 2006;54:569-78. Weber U, Lambert RG, Østergaard M et al. The diagnostic utility of magnetic resonance imaging in spondylarthritis: an international multicenter evaluation of one hundred eighty-seven subjects. Arthritis Rheum 2010;62: 3048-58. Weber U, Østergaard M, Lambert RG et al. The impact of MRI on the clinical management of inflammatory arthritides. Skeletal Radiol 2011;40:1153-73. 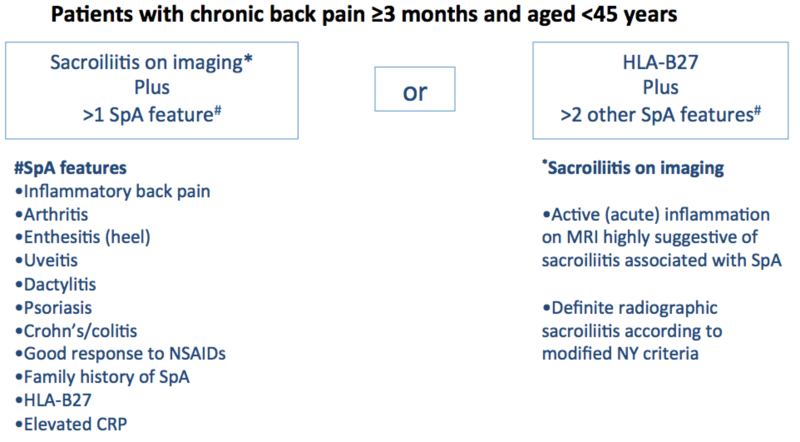 Braun A, Saracbasi E, Grifka J, Schnitker J, Braun J. Identifying patients with axial spondyloarthritis in primary care: how useful are items indicative of inflammatory back pain? Ann Rheum Dis. 2011 Oct;70(10):1782-7.
van den Berg R, de Hooge M, Rudwaleit M, Sieper J, van Gaalen F, Reijnierse M, Landewé R, Huizinga T, van der Heijde D. ASAS modification of the Berlin algorithm for diagnosing axial spondyloarthritis: results from the SPondyloArthritis Caught Early (SPACE)-cohort and from the Assessment of SpondyloArthritis international Society (ASAS)-cohort. Ann Rheum Dis. 2013 Oct;72(10):1646-53. Hermann J, Giessauf H, Schaffler G, Ofner P, Graninger W. Early spondyloarthritis: usefulness of clinical screening. Rheumatology (Oxford). 2009 Jul;48(7):812-6. The SPADE tool has been developed to reduce the delay in diagnosis of patients with Axial Spondyloarthritis (AxSpA). Several validated criteria sets exist to aid the diagnosis of AxSpA. Many referral strategies have been devised to optimize the diagnosis of AxSpA. Studies have shown that these strategies result in the diagnosis of AxSpA in 30 to 40% of patients referred to secondary care. There are 2 issues with these referral strategies. Whilst these strategies are simple, they require clinicians to remember the specific criteria sets and apply them in busy clinical settings. Furthermore, with financial constraints in healthcare, ensuring that only the patients that need to be assessed in secondary care are referred is paramount. As a result strategies to improve the diagnosis of AxSpA in secondary care to over 40% should be explored. The ease of access of tools such as SPADE is critical to ensure that clinicians will use it to aid decision making. An similar example of a web based tool is the FRAX tool, which aids decision making in patients with osteoporosis. A quantitative estimation of the probability of axial SpA in a young patient with chronic back pain has been previously proposed. This approach involves multiplying the likelihood ratios of SpA specific features. The simplification of this approach was suggested by Feldtkeller et al in 2013. The SPADE tool has been developed based on the Feldtkeller adaptation. The probability of Axial SpA derived from the 'SPADE Tool' is displayed on a chart with clear instructions for the user on what action should be taken next. This tool is not intended to replace the clinician assessing a person with possible ankylosing spondylitis. One of the key reasons being that the tool does not incorporate any negative findings in the diagnostic algorithm. The clinicians diagnostic skills, which include the ruling out of other possible diagnoses, remains of significant importance.